Latin is helpful for nearly everyone! Influencing English and Romance languages in both vocabulary and grammar, learning Latin can help students easily learn new vocabulary and do better on tests. Latin is also a language of history, and can unlock ancient texts and inscriptions, as well as the Vulgate. This Volume 1 textbook includes 16 chapters which provide an introduction to the language of Latin, as well as the history of Italy, Rome, the Republic, and other aspects of Roman life. Using the Bible as the primary source, this unique curriculum provides information on the alphabet, pronunciation, declensions, moods, and other basic grammatical information. Charts, examples, and graphs provide helpful notes on memorizing or recalling certain facts. Exercises are included, though they must be written in a student-provided notebook. Following a story of a Roman centurion and his family, students will learn new vocabulary in context as they read. Ecclesiastical pronunciations used in church music are used. 96 pages plus dictionary and forms included. Grammatical and Topical index in back of textbook. Each vocabulary includes English derivatives for the Latin words which may be used for spelling or vocabulary words for English class. Volume 1 has been accredited by the University of California for a year's high school Latin credit; the authors recommend grades 6 & up. 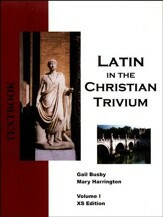 This textbook is in color; the alternative Latin in the Christian Trivium, Vol 1 Textbook, XS Edition (Black and White) does not contain color. 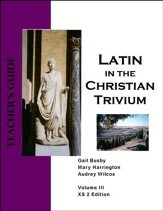 This teacher's guide includes all of the sold-separately student text, as well as reproduced pages-with-answers overlaid for the student textbook exercises, study sheets, drill sheets, and tests for Latin in the Christian Trivium Volume 1's textbook and "Study Sheets and Drill Sheets" book. Notes to the teacher are included where helpful. An Instructor's Resource CD-ROM includes a powerpoint and tests from the teacher's guide. 124 pages, softcover, indexed. 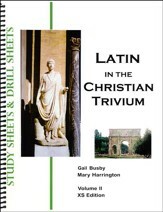 This Study Sheets and Drill Sheets Volume I XS Edition accompanies the sold-separately "Latin in the Christian Trivium Volume 1" textbook, and provides additional in-depth practice opportunities. Students will be asked to do true and false questions, sentence practice, conjugations, translations, and more. One "study sheet" (often multiple pages) and one "drill sheet" per chapter. Answers are not included, but are in the sold-separately Teacher's Guide. Spiralbound. 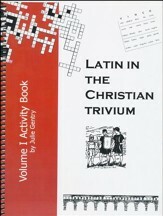 This activity book accompanies the sold-separately Latin in the Christian Trivium Textbook Vol. 1. This book features fun supplemental games and activities that will help reinforce lesson content, grammar, vocabulary, and Roman history. 86 pages, softcover and spiralbound. Answers are included. 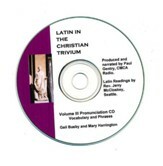 This pronunciation CD accompanies the Latin in the Christian Trivium Volume 1 curriculum. Tracks progress through each chapter, pronouncing specific Latin phrases, boxes, vocabulary, exercises, and reading lessons. One track per chapter; the track listing provides the page numbers. Since Chapter 16 is a supplementary chapter and was recently added, there is no pronunciation guide for it on the CD. Diacritical marks are given in the text. Latin is helpful for nearly everyone! Influencing English and Romance languages in both vocabulary and grammar, learning Latin can help students easily learn new vocabulary and do better on tests. 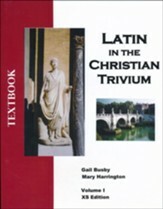 This Volume 2 textbook includes 18 chapters which provide an continuing introduction to the Latin language begun in Volume 1. 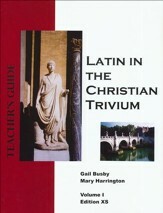 Using the Latin Vulgate as well as an original Latin story as the base for reading passages, this level covers interrogative pronouns, the pluperfect and future perfect tenses, objective genitive, predicate accusative, demonstratives, adjectives, adverbs, the fourth declension, present participles, and more. Exercises are included, though they must be written in a student-provided notebook. Following a story of a Roman centurion and his family, students will learn new vocabulary in context as they read. Ecclesiastical pronunciations used in church music are used. 126 pages plus dictionary and forms included. Grammatical and Topical index in back of textbook. Each vocabulary includes English derivatives for the Latin words which may be used for spelling or vocabulary words for English class. Grades 7 & up. 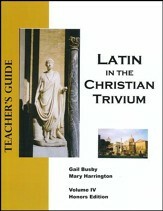 This teacher's guide includes all of the sold-separately student text, as well as reproduced pages-with-answers overlaid for the student textbook exercises, study sheets, drill sheets, and tests for Latin in the Christian Trivium Volume 2's textbook and "Study Sheets and Drill Sheets" book. Notes to the teacher are included where helpful. An Instructor's Resource CD-ROM includes a powerpoint and tests from the teacher's guide. 124 pages, softcover, indexed. This Study Sheets and Drill Sheets Volume II XS Edition accompanies the sold-separately "Latin in the Christian Trivium Volume 2" textbook, and provides additional in-depth practice opportunities. Students will be asked to construct sentences using Latin words, conjugate, write the present stems and perfect stems for verbs, translate sentences, identify different parts of speech, and more. One "study sheet" (often multiple pages) and one "drill sheet" per chapter. Answers are not included, but are in the sold-separately Teacher's Guide. Spiralbound. 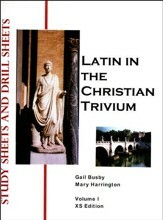 This workbook features study sheets and drill study sheets that accompany the sold-separately Latin in the Christian Trivium, Vol. II Textbook XS Edition. Drill sheets provide lists of Latin sentences to translate, while study sheets provide a review of many different exercises, including tenses, translations, writing, and vocabulary. Spiral-bound. 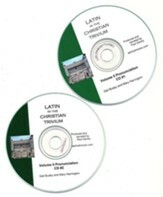 This pronunciation CD provides the pronunciation for all Latin vocabulary, most reading lessons, and phrases in the Latin in the Christian Trivium Volume II, XS Edition curriculum. This Volume 3 textbook includes 20 chapters which cover the fifth declension, infinitives, date of reference/purpose/possession, the subjunctive mood, hortatory subjunctive, result clauses, indirect questions, deponent verbs, impersonal verbs, the dative with intransitive verbs, and more. Using the Bible and church texts as the primary sources, this unique curriculum provides information on the alphabet, pronunciation, declensions, moods, and other basic grammatical information. Ecclesiastical pronunciations used in church music are used. 142 pages plus glossary and conjugations included. Grammatical and Topical index in back of textbook. Each vocabulary includes English derivatives for the Latin words which may be used for spelling or vocabulary words for English class. One year's high school Latin credit; the authors recommend grades 6 & up. 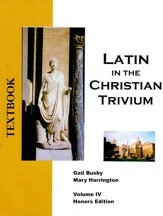 This teacher's guide includes all of the sold-separately student text, as well as reproduced pages-with-answers overlaid for the student textbook exercises, study sheets, drill sheets, and tests for Latin in the Christian Trivium Volume 111's textbook and "Study Sheets and Drill Sheets" book. Notes to the teacher are included where helpful. An Instructor's Resource CD-ROM includes a powerpoint and tests from the teacher's guide. 137 pages, softcover, indexed. 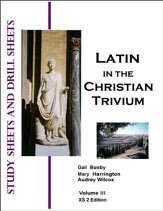 This "study sheets and drill sheets" book accompanies the sold-separatelyLatin in the Christian Trivium textbook. Organized by chapter, study sheets and a drill sheet will help students practice their Latin skills. Over 100 sheets included. Spiralbound. 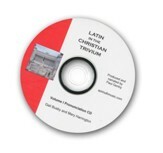 This pronunciation CD accompanies the Latin in the Christian Trivium Volume 111 curriculum. 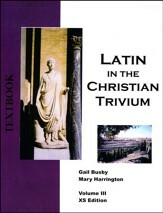 Tracks progress through each chapter, pronouncing specific Latin phrases and vocabulary. One track per chapter. This Volume 4 honors textbook includes 15 chapters which focus on increasing Latin vocabulary; it is assumed students can use their grammatical knowledge that's been taught in the previous volumes. Using the Latin Vulgate as well as an original Latin story, students will read and translate larger passages; reading passages average two pages in length. Historical notes are also included.